Except in the wettest regions, it is restricted to upland rainforests. It forages in family groups in leaf litter, where it scratches vigorously. Its loud calls vary from place to place so that many local dialects are identifiable. It is also known as the Northern Logrunner, and is one of only two logrunner species. In the past it was also referred to as Spaldings Spinetail. Its tail has adapted to aid in searching for food as it has strong spiny shafts which the bird is able to prop itself against whilst leaning backwards. It then uses one foot to throw leaf litter aside in search for animals to eat. As it does this, the litter tends to cover the bird itself, and it almost disappears from sight. Each flock has its own permanent territory, and groups of approximately 3 to 8 move about quickly together. The birds in each group are probably closely related. At dawn and dusk the Chowchillas sing loudly, a characteristic sound of the upland rainforests. 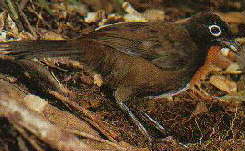 Their strong chorus is similar to that of a lyrebirds call. Males and females can be distinguished by their different breast colours; males have a white colour and females have an orange-brown colour, sometimes with a small white patch below. The breeding season is from April to November. the Chowchilla is numerous nearby Chambers Wildlife Rainforest Lodge at Lake Barrine.